Harm, Healing, and Human Dignity is a faith formation resource to help parishes, small groups, and individual believers reflect on the Catholic call to restorative justice. Through Scripture, Catholic teaching, eye-opening statistics, and personal stories, each chapter prompts prayerful consideration of the place of human dignity and the common good as we respond to harm, violence, and the death penalty in the United States. Prepared in cooperation with the highly regarded Catholic Mobilizing Network for the Abolition of the Death Penalty, Harm, Healing, and Human Dignity will help Catholics consider what it means to choose hope over death and redemption over vengeance. It's a choice that can foster healing, transform relationships, and build the culture of life to which our Catholic faith calls us. Caitlin Morneau is Director of Restorative Justice at Catholic Mobilizing Network (CMN), the national organization that seeks to end the death penalty and promote restorative justice. She oversees development of programs that increase awareness and use of restorative practices in Catholic communities. Morneau contributed to Redemption and Restoration: A Catholic Perspective on Restorative Justice and has an MA in Conflict Transformation from Eastern Mennonite University's Center for Justice and Peacebuilding. Harm, Healing, and Human Dignity provides an excellent description of restorative justice principles and examples of everyday applications. The reader will encounter an exceptionally understandable narrative, weaving Catholic social teaching and theology through examples of restorative justice stories while also offering relevant prayers and reflections. A must read for anyone interested in how restorative justice interfaces with one's faith and values. 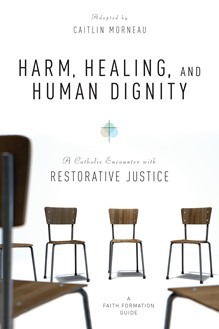 Harm, Healing, and Human Dignity allows the reader to come to a fuller understanding of how restorative justice and Catholic social teaching embrace one another in a way that leads to the creation of communities of hope. It helps us to see beyond the pain and trauma to the possibilities of a life that has meaning and purpose.